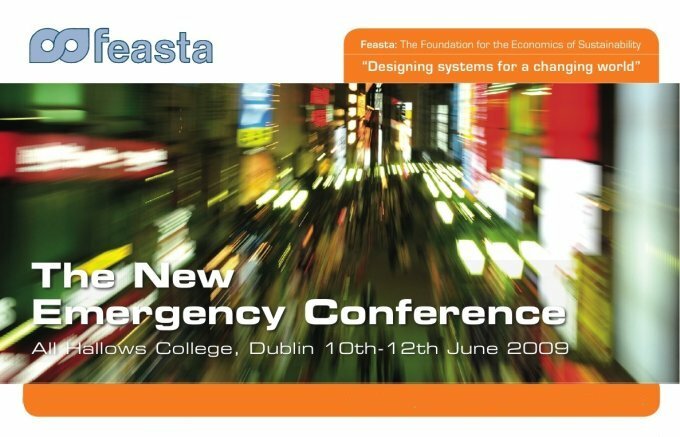 Multimedia recordings of all the presentations from this conference are now available for free download from the Feasta vimeo site. Click on the embedded links below to view presentations. Tuesday June 9th, 7.30pm The Davenport Hotel, Merrion Square, Dublin 2. Dmitry Orlov, author of Reinventing Collapse, explored the question "What is it that we are looking at here, and what can we do about it?" He believes that there is not much hope for a global financial system and economy, nor should there be given the huge problems it is causing with the environment. If this is the case, then what can people do, in terms of coping with financial collapse, creating community resilience, and re-skilling for the new, local, self-reliant, highly manual age that is coming? Wednesday June 10th, All Hallows College, Drumcondra, Dublin 9. Prologue - Emergency? What Emergency? Chris Vernon, European editor of The Oil Drum, surveyed the prospects for oil, gas and coal supplies over the next 50 years. He argued that, because the energy cost of producing these fuels is rising as more difficult sources have to be used, the actual amount of energy that will be available for other purposes will fall off more quickly than has been recognised so far. Bruce Darrell gave a talk on food systems in which he surveyed the effects of strategic global influences on the future of our food supply. (His talk replaced that of Kate Bailey, who was unable to travel to attend the conference). Alex Evans' report on climate change and global institutional reform was published by the Center on International Co-operation earlier this year. He presented the case for basing a framework for dealing with the climate crisis on a scientifically derived stabilisation target. Such a framework should also share the global carbon budget out between the world's nations according to a transparent, equitable formula. Parallel breakaway sessions explored the topics of Energy, Climate and Food in more detail, and included additional presentations and roundtable discussions. Julian Darley , founder of the Post Carbon Institute, reviewed the non-economic factors that influence decisions making. He explained how a knowledge of them can be used to get new systems introduced. The factors include culture, social and individual psychology, business and political fashions, perceptions of what will be publicly acceptable, and what other opinion leaders and decision-makers are thinking and doing. Thursday June 11th, All Hallows College, Drumcondra, Dublin 9. Dmitry Orlov , author of Reinventing Collapse, explained why efforts to extend the lifetime of the industrial, fossil fuel-based economy are misguided and will fail. He then presented alternatives, describing how patterns of land use can be transformed into patterns of habitat creation and how informal local networks of sustainable non-fossil-fuel-based production and distribution can be created. Physicist David Korowicz documented the disturbing growth in the complexity of trade and financial networks and in the various types of infrastructure. He sees the collapse process as a system of re-enforcing feedbacks that cut investment in energy and R&D and cause supply chains and IT networks to break down. Ludwig Schuster , who advises many of complementary currency systems that have sprung up in Germany, looked at the role that money systems have to play in moving economies away from the exponential growth paradigm. He argued that, as different activities offer different benefits, special currencies may be needed for particular purposes. Mark Rutledge , an environmental consultant, argued that the adoption of Cap and Share, Feasta's proposed framework for a global climate treaty, is a necessary tool for dealing with peak oil and the current world recession. Unless it is used, he said, any economic recovery will be strangled at birth as oil prices rise again. Architect James Pike co-founded Urban Forum, which is made up of five bodies representing the professionals in the Irish construction industry. He explained how a non-debt method of financing property development, Equity Partnerships, can not only rescue completed developments which can't be sold in the present market, but can also provide a way in which all occupiers gain a stake in future developments. Equity partnerships are equally suitable for community energy projects. Parallel breakaway sessions explored in more detail the topics of Currencies, Trade and Infrastructure, and included additional presentations and roundtable discussions. Davie Philip , coordinator of the Irish Transition Towns network, sees the 'new emergency' as a 'once-in-a-species' opportunity to make a controlled, planned transition to a post-industrial society. He asked whether the Transition Towns initiatives emerging around the world are up to this challenge and what more this young movement could be doing to facilitate the building of resilient communities. John Sharry , a family and child psychotherapist, looked at the way communities are responding to the current crises. He drew on modern psychological models of motivation and change, and of how people deal with threat and loss, to suggest strategies which can be used both to help individuals change and to galvanise communities into collective action. Anne B. Ryan is the author of Enough is Plenty which will appear later this year. She argued that the adoption of a new self-limiting worldview is as crucial as the adoption of new technologies. "We are all born with the capacity for enough and everybody has a part to play in the creation of a culture of enough, as a way to understand the world and to live in it," she says. Friday June 12th, All Hallows College, Drumcondra, Dublin 9. Eco-architect Emer O'Siochru believes that the proximity principle has to be turned on its head if communities are to become sustainable. She argued that, instead of bringing similar activities closer together to reap the benefits of scale and agglomeration, different activities should be beside each other to be more energy- and carbon-efficient. She wants new, low-carbon food, energy and shelter production systems to be integrated locally to transform and invigorate rural communities. Bruce Darrell , urban gardener, Cloughjordan eco-villager and a founder of Dublin Food Growers, thinks that a secure food supply is an essential part of the response to the climate, energy, economic and health crises. As state planning for such a supply has been grossly inadequate, he detailed the key actions that we need to take at a personal, community and regional level to compensate. Dan Sullivan is director of Saving Communities, a US NGO working on a wide range of community development issues. He contrasted the experience of Pittsburgh and Cleveland in the present downturn. Cleveland is struggling to stem a complete collapse of its housing market while in Pittsburgh, foreclosure rates are low, home prices are climbing slightly and construction rates are increasing. He attributed the difference to the fact that Pittsburgh has a site value tax and Cleveland does not. Michael Hayes , Research Professor in the Carbolea group at the University of Limerick, pointed out that Ireland has more high quality soil per head of population than any other country in the EC, and the rainfall and climate to grow biomass very efficiently. He described how this biomass could be refined into a wide range of valuable products, many of which would replace petrochemicals. Corinna Byrne , co-ordinator of the Carbon Cycles and Sinks Network, examined the policies needed to get Irish land to absorb CO2 rather than release it. Besides discussing how the large amounts of carbon locked up in peatlands can be safeguarded, she reviewed the role that biochar could play in reducing nitrous oxide and methane emissions and building up the fertility and carbon content of the soil. Workshops Parallel breakaway sessions explored in more detail the topics of the Commons, Resources and Natural Carbon Cycles, and included additional presentations and roundtable discussions.